This afternoon my son, Ryan, and I headed up to Minneapolis to check out the car show at the Nokomis Block Party. We met up with Joel and his son, Liam, there. I had hoped we’d find a Dodge similar to ours there. It would be ideal to see another one so we could see what a restored Dodge looks like and to find out more about resources for ours. But we didn’t find any Dodges at this show. There were many very cool cars, though, and several from about the same vintage as ours. We got to talk to a few of the owners and make some connections – AND see cool cars! – so the car show was well worth the trip. I took many pictures and will post them later on. After the show we headed over to Joel’s house to hang out and see the Dodge. Joel has been hard at work, as usual, and updated us on all the work he’s done. He pulled out the front seat so he could rip out the carpeting and get a good look at the floor. 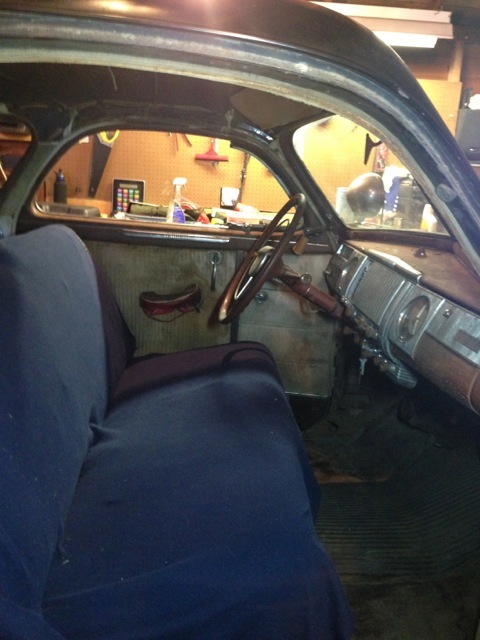 The floor is rusty in the front but pretty solid in the back. He also pulled out the brake, clutch and accelerator pedals (but I honestly can’t remember why – Joel, you’ll have to comment and fill us in). There are some broken things to replace and I know Joel tracked down one of the parts and headed out to get it just a couple of hours ago. So what else did we do? Well, we started up the Dodge, of course, and let her run for a bit. It was kinda a challenge to start her up without pedals or a front seat but Joel made due. Ryan and Liam sat in the back seat and had fun being part of the action. At one point, Liam pretending to step on the accelerator and “start” the Dodge on his own. 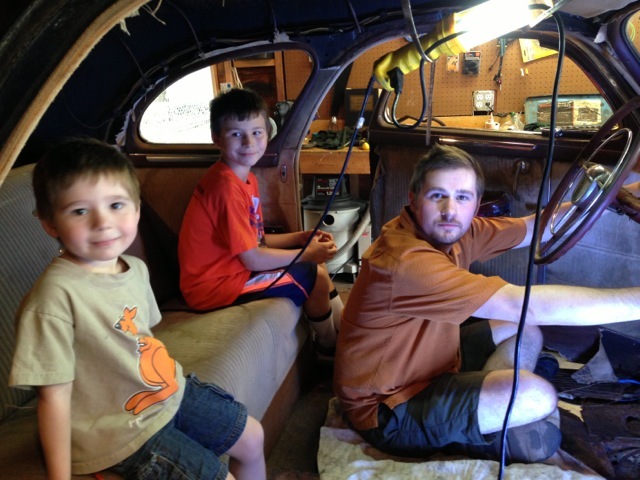 I took a video of all three of them sitting in the Dodge and starting her up and will upload that soon. For now, I will post a picture. The “boys” sure look like they are having fun! After starting the Dodge and hearing her engine idle (first time I’ve really heard her run for any length of time. It is loud. It sounds wonderful), I finally got a chance to polish some chrome. I chose a piece of interior trim to polish. I tell you, it’s the best thing to see how quickly the chrome shines up. See the before and after pictures below. 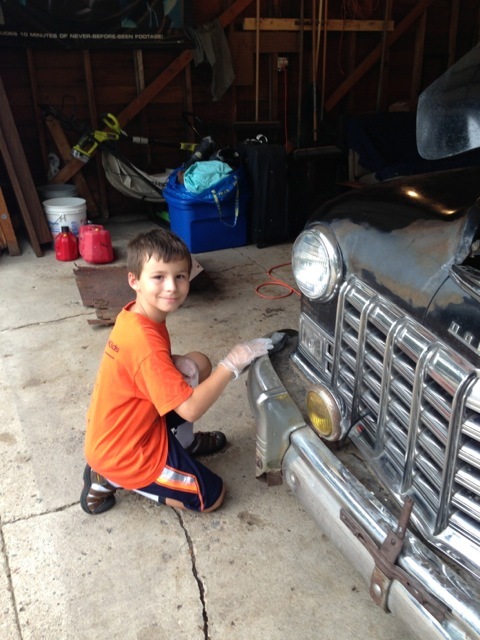 Ryan wanted to get involved, too, so he and I worked together on the front grill and bumper for awhile. Then I took Liam for a wagon ride and Ryan followed along on Liam’s little bike. Joel kept working on cleaning up the Dodge. 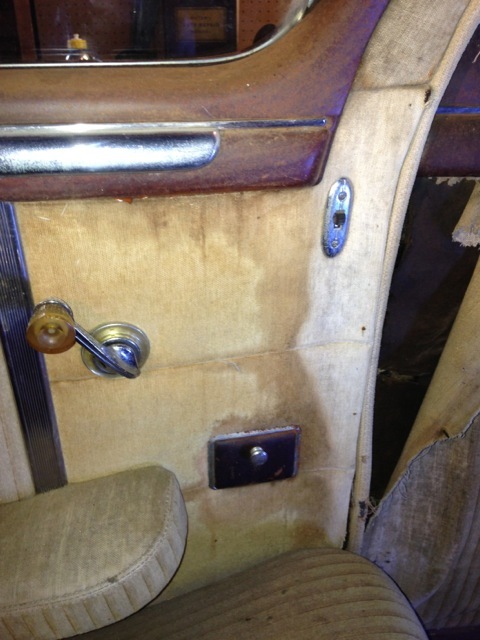 Wagon ride done, we spent some time looking at the interior trim and the door panels. All of the metal appears to be painted a warm brown with faux woodgrain. The interior fabric is a warm tan in two different fabrics – one striped and the other not. I believe all of the tan fabric is mohair and the trim fabric is faux leather in a rich brown. Once my schedule settles down a bit, I’m planning to paint some practice panels to see if I can replicate the woodgrain to our satisfaction. 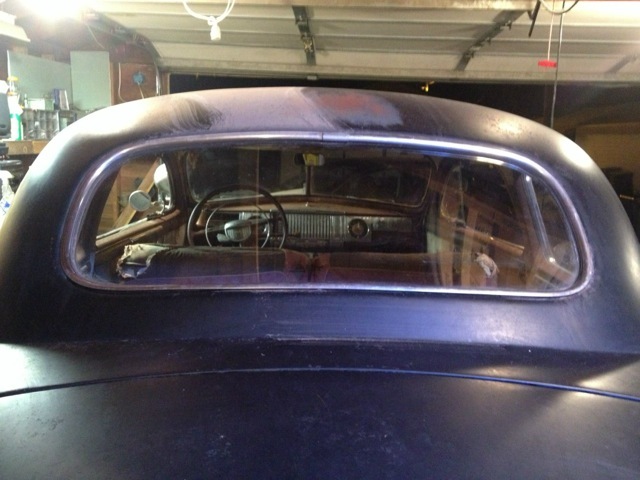 If so, maybe this winter I’ll start to tackle the interior window trim. We’ll see. As for recovering the seats, I think that project will wait awhile. The rear seat is oh so perfect even though it’s really worn. It’s hard to think of ripping it apart and redoing it just now. And, frankly, we don’t have enough cash sitting around to start that project. 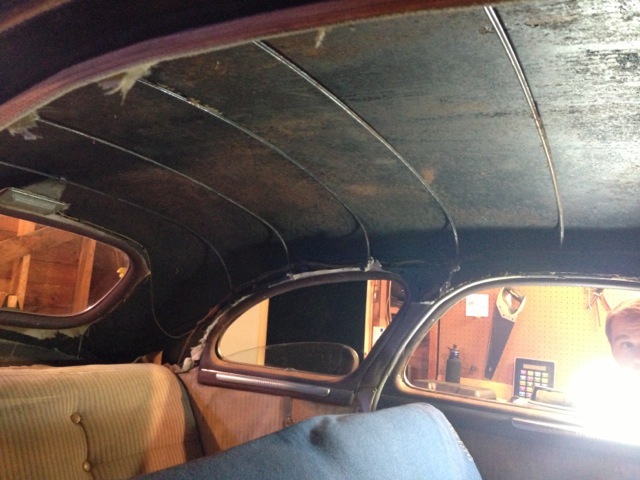 Interior shot showing both kinds of fabric and the faux wood trim around the window. 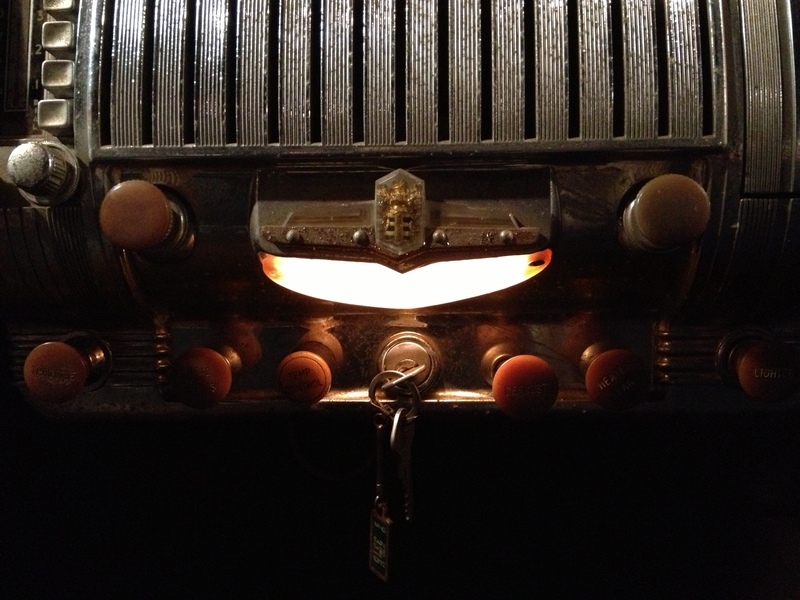 Also note the little switch near the door – we think this is for the interior light near the rear window but are not sure. Interior inspection complete, we polished and cleaned a bit more, hung out and talked Dodge project a bit, and then it was time to for Ryan and I to head on home. All in all, it was pretty much a perfect afternoon. I’m making Thursdays my Dodge Work Days. Joel has Thursdays off of work so I’m just going to plan to head over to his house and help out. I wish that I could get over to Joel’s to help out more often – I am pretty envious that he has the Dodge right there in his garage and can work on it any time – but Joel’s garage is the right place for the Dodge. And, even though I’m not there in person most of the time, Joel is doing an excellent job of keeping me in the loop of what is going on via text messages, phone calls and his great blog posts. So yesterday I headed over to Joel’s figuring I might get good and dirty polishing chrome or something. It turned out that our work day turned into more of a making connections and hanging out sort of day – but that’s all right. Proof that I really have done work on the Dodge. First, we went out to the garage and spent some time just looking at the Dodge and trying to figure out what we should do next. There are so many options that it’s overwhelming. 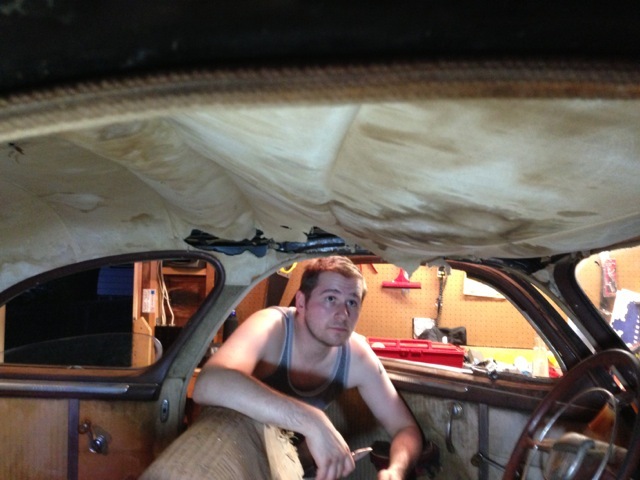 Our older brother, Don, planned to come over later on and help Joel with some engine work so we didn’t want to do that. We could polish chrome, our original plan, or pull out the carpet. Or lots of other things. 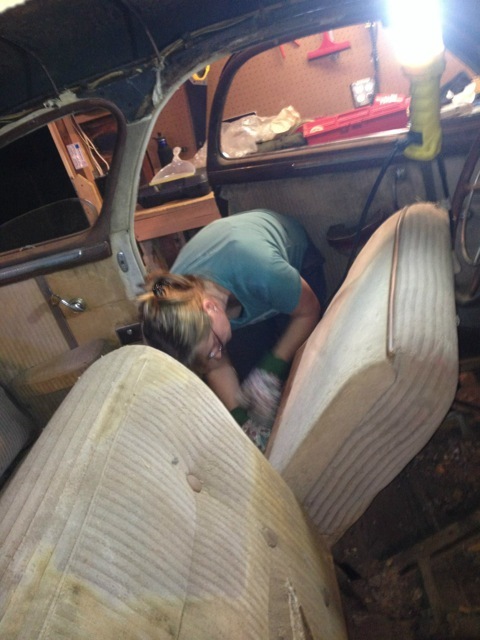 After some talking and much leaning on the front fender and looking under the hood, Joel went to start her up. The engine would turn and turn but wouldn’t kick over. So with Joel in the driver’s seat and his son, Liam, smiling next to him, I poured a small amount of gas into the carb while Joel pressed the start button. And….the Dodge started….and ran….for a very short second or two! Joel has seen and heard the Dodge start several times now but this was my first and let me tell you, it was exciting to have everything work together for that moment in time. But it was over soooo quickly. So what to do next? We decided to buy some parts like a carburetor rebuild kit and some hoses. So we headed in to do some research on where to get them. And we both got distracted (just a bit), and ended up looking online at places that restore classic cars and we found there is a classic car restoration place just a few blocks from Joel’s house. So we changed our plans and decided to walk to the shop and give Liam a wagon ride in the process. Joel’s neighbor who was out cleaning his garage floor (sure sign of a car guy) is into Muscle Cars. We visited Hiawatha Cyclery because, well, it was right across the street and both Joel and I like bikes. We talked bikes for awhile and had fun. We will visit again. 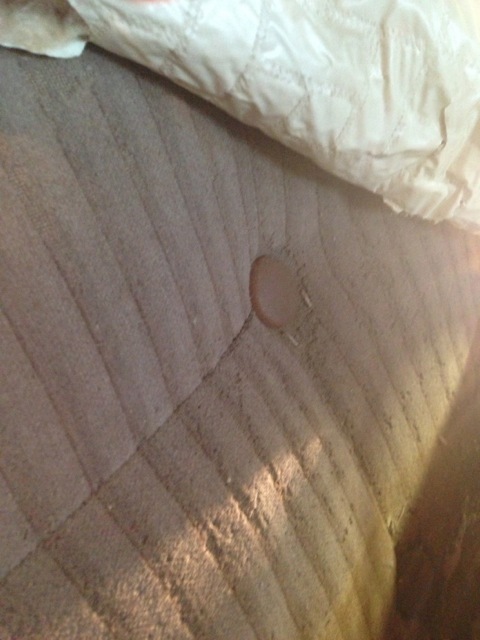 We stopped into Recovering Room, a little upholstery shop, to ask if they do automobile upholstery. Mavis, the owner, said she does not but she knows a couple of people who do. So, visits done, we went back to Joel’s and talked about going to a shop to buy parts but Liam needed a little rest so we ended up watching some how-to videos about how to replace a headliner. And then we looked online at fabric choices for when we get to the point of doing the seats, headliner and door panels. And realized that we have a lot of work ahead of us. But we knew that. Before I knew it, it was time for me to head home. I realized that I never really did any work on Dodge Work Day. But, you know what, that’s okay. Why? Well, the Dodge project is more about just getting the Dodge running and restored. You see, I haven’t spent this much time with my little brother in ages and can’t remember a day that the two of us just got to hang out together. So this Dodge Work Day, even though I didn’t get dirty or polish any chrome, was very much worthwhile because I spent it with my nephew, Liam, and my little brother, Joel. Nice view of the lovely, curved, rear window. Just a note: Joel did get out and buy some parts. Our brother, Don, did in fact stop over and told Joel he needed to adjust the Dodge’s points. Today Joel sent me several video clips of the Dodge running pretty smoothly for an old car that hasn’t run in about 20 years. 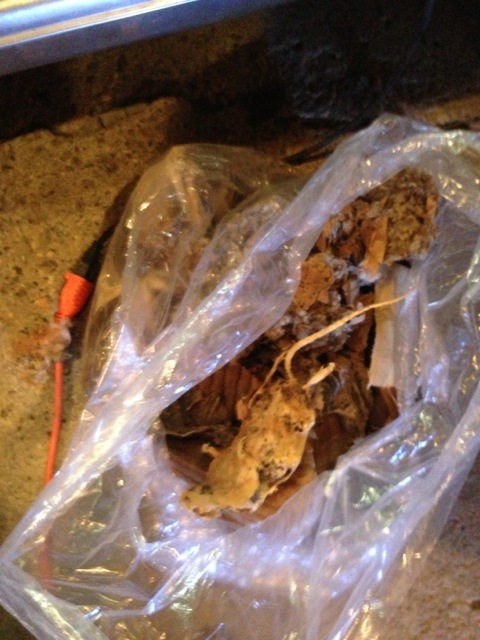 Joel plans to rebuild the carburetor after work tonight. I predict he’ll write a blog post about all this in the wee hours of the morning so you will know the details.